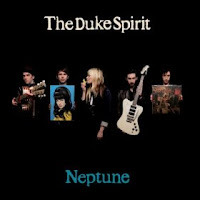 Neptune, the second full-length from U.K. band The Duke Spirit, finds the group delivering on the promise of their debut LP Cuts Across the Land. Their first album was a dark bare bones effort but this time out, the group is letting in some light. The result is an album that is more pop-centric but still captivating. Fans of the original album will rally around songs like “Dog Roses” that find the band employing the usual tools of their trade (crunchy guitars and tough-talking songs) but the cheery production behind “My Sunken Treasure” should lure new listeners. If there’s one song that perfectly blends the conflicting light/dark sides of The Duke Spirit together, it has to be the mid-tempo rocker “The Step And The Walk.” It takes the bands My Bloody Valentine-esque roots, adds in the here and now, and dashes headlong into the future.